Comparison of the effects of reflexology and massage therapy on primary dysmenorrheal. Primary dysmenorrhea is one of the most prevalent debilitating problems in reproductive ages. This study aimed to compare the effects of reflexology and massage therapy on pain intensity, pain duration, and anxiety level resulting from primary dysmenorrhea. This controlled clinical trial was conducted on 102 students with primary dysmenorrhea. The samples were randomly divided into reflexology, massage, and control groups. In the first group, reflexology was done 20 min per day for 10 days. Besides, the second group received massage with lavender essence. The interventions were done in both groups for 2 consecutive menstrual cycles. The participants’ pain intensity was measured using Visual Analog Scale (VAS) and their anxiety level was evaluated by Spielberger’s questionnaire. Pain duration was assessed, as well. The measurements were performed before and at the end of the second and third menstrual cycles. The results showed a significant difference among the three groups regarding pain intensity in the second and third months (P>0.001) and pain reduction was more considerable in the massage group. Also, a significant difference was observed among the three groups concerning the mean of pain duration in the second and third months (P=0.01). However, the three groups were not significantly different with respect to the mean anxiety levels. Yet, within-group comparisons revealed a significant reduction in anxiety level in the massage group (P=0.017). Based on the study findings, it seems that both reflexology and massage therapy were effective in the reduction of some symptoms of dysmenorrhea. Despite different pain control methods, dysmenorrhea is still one of the health care challenges . Dysmenorrhea refers to cramping pain in the lower abdomen which is reflected to the lower and upper parts of the waist . These cramps result from increased level of prostaglandin F2α and cause ischemia and pain . The prevalence of primary dysmenorrhea has been reported to be 7.1-97% . Primary dysmenorrhea can considerably reduce women’s quality of life. The treatments used for dysmenorrhea include pharmacological and complementary medicine . Anti-inflammatory drugs are the first therapeutic line for primary dysmenorrhea; however, they might be accompanied by some undesirable side effects, such as dyspepsia, headache, and drowsiness . Due to the temporary effect of pharmacological methods and problems, such as pharmaceutical dependence and unnecessary costs, tendency to use non-pharmacological methods has been expanded . Complementary treatments include essential fatty acids, acupuncture, and herbs , reflexology , and massage therapy . Massage includes regular and rhythmic movements which are uniformly applied on soft body tissues . Massage is usually done by aromatic oils  and its useful effects include anti-inflammatory effects, sleep improvement, reduced muscle cramping, and stress and pain alleviation . Lavender is one of the aromatic oil extracts which is used in massage therapy . 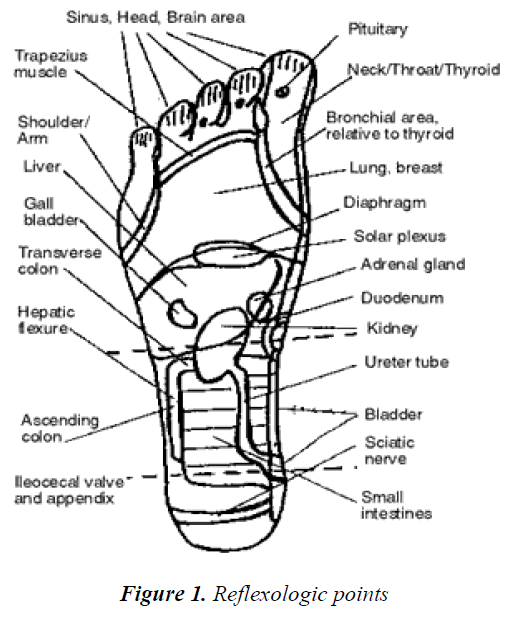 Reflexology is a nonpharmacological method from the manual treatment group . It is a special type of foot and hand massage. It is believed that there are some areas in hands and feet which are related to glands, organs, and other body parts . The most important theory about the effect of this method is connection between hands and feet, and other body parts through energy lines or channels. Some studies have shown that regular reflexology could reduce anxiety, increase relaxation, and improve health . Considering the prevalence of primary dysmenorrhea and its undesirable effects, the present study aims to compare the impacts of massage therapy and reflexology on primary dysmenorrhea. The present controlled clinical trial was performed on 102 students from dormitories of Shiraz University who had primary dysmenorrhea. At the beginning of the study, after giving complete explanations about the research, written informed consents were obtained from the participants. Then, pain intensity was measured by VAS, which is a 10-cm ruler (0 as the minimum pain and 10 as the maximum pain), and the individuals meeting the inclusion criteria were entered into the study. This instrument is standard and its validity and reliability have been approved in different studies . Pain duration was recorded in hours. Moreover, Spielberger’s questionnaire including 40 questions in state and trait dimensions was completed by the participants 24 h after their maximum pain intensity. Spielberger’s test was used by Agha Mohammadi et al. (2008) in 150 patients undergoing surgery and its reliability was reported to be 97%. The validity and reliability indexes found in the study by Agha Mohammadi et al. were the basis of the present research . The samples were entered into the study using convenience sampling method and were divided into massage, reflexology, and control groups by permuted block randomization using the table of random numbers. In the reflexology group, the participants’ beginning of menstrual cycle was determined and, 10 days prior to the due time, massage was done on each foot for 20 min per day (totally 40 min for both feet) on special dysmenorrhea areas in reflexology, including liver, spleen, kidneys, hypophysis, and solar plexus points(Figure 1) . This intervention was performed for 2 consecutive menstrual cycles. In this group, pain intensity and anxiety level were measured using VAS and Spielberger’s questionnaire, respectively before starting reflexology (first month) and on the first day of the second and third menstrual cycles. In the massage group, lavender essence based on olive oil with the purity of 10% was used. Sensitivity of lavender essence was tested by putting some drops of oil essence on the skin of the inner part of the arm for 15 min. Since menstrual pain in primary dysmenorrhea occurs some hours before the beginning of bleeding to 24-48 h after the beginning of menstrual period, most individuals experience the peaks of these pains on the first day . Therefore, the participants of this group were asked to contact the researcher during their maximum pain intensity (usually the first day). The researcher first explained the procedure. Then, the patients lay in supine position and effleurage massage of the upper areas of symphysis and umbilicus was done rotationally and clockwise with lavender essence (each for 15 min). Pain intensity was measured and recorded immediately after the massage using VAS. On the second day of the menstrual cycle, the stages of the previous day were repeated almost at the same hour and equally for all the participants. Spielberger’s questionnaire was completed before the first massage and 24 h after the second one. Massage was repeated for two consecutive menstrual cycles. The control group received no interventions and their pain intensity, pain duration, and anxiety level were measured in the first menstrual cycle and 4 and 8 weeks later (concurrent with the first days of menstruation in the second and third cycles). To prevent error, the participants themselves measured pain intensity and completed Spielberger’s questionnaire. The study data were entered into the SPSS statistical software, version 20 and were analyzed using one-way ANOVA, repeated measures ANOVA, and post-hoc test. Significance level was set at P<0.05. Ethical considerations: After receiving the code from Ethics Committee and permission of the Research Vice-chancellor of Shiraz University of Medical Sciences, registering the study in Iranian Registry of Clinical Trials under the code IRCT2013022611945N2, and completing written informed consents at the beginning of the study, massage and reflexology methods were explained to the participants and the study was conducted. This study was conducted on 102 students living in dormitories of Shiraz University. The results showed no significant difference among the three groups regarding age, mean Body Mass Index (BMI), age at menarche, and duration of menstrual cycles before the study (Table 1). Also, the three groups were similar with respect to the mean of pain intensity and duration before the intervention. However, a statistically significant difference was observed among the three study groups in terms of pain intensity in the second and third months (P>0.001) and pain reduction was more considerable in the massage group (Table 2). In addition, a significant difference was found among the three groups concerning the mean of pain duration in the second and third months (P=0.011) (Table 3). Nevertheless, the mean levels of anxiety were not significantly different among the three groups. Yet, within- group comparisons revealed a significant reduction in anxiety level in the massage group (P=0.017) (Table 4). The first goal of this study was to compare the mean of pain intensity in massage, reflexology, and control groups. The study results revealed a significant difference between the massage and reflexology groups and the control group regarding menstrual pain intensity after the intervention. In the study by Epi et al. (2010), the effect of massage on dysmenorrhea was investigated among students. The students received lavender or paraffin massage for 15 min and the oil used in each group was changed in the third cycle. The results showed that lavender massage was more effective in reduction of dysmenorrhea, but reduced dysmenorrhea was observed in the paraffin group, as well . These results were similar to those of the present study although massage duration was different in these two studies. In the research by Kim et al. (2011), dysmenorrhea intensity was measured among nurses. The intervention group received combined massage of aromatic oils (except for lavender), the placebo group received massage with almond oil, and no intervention was performed in the control group. The results revealed that anxiety level and pain intensity reduced more considerably in the aromatic oils massage group compared to the placebo massage group , which was in line with the findings of the present study. The main mechanism of massage for pain alleviation is unknown. Yet, the most important theory in this regard is gate control theory of pain which is based on the fact that anterior spinal horn cells use special fibers for passage of each message. According to the axonal diameter and the conduction velocity, nerve fibers can be classified into three types – A, B and C .Pain message slowly passes through the unsheathed C fibers, while massage message rapidly passes through sheathed A fibers. These messages rapidly pass by massage, making pressure messages and thus blocking the pain message gate. The gate control theory suggests that the signals encounter ‘nerve gates’ at the level of the spinal cord and they need to get cleared through these gates to reach the brain. . Massage also improves blood and lymph flow, reduces stress, and loosens contracted muscles . Aromatic oil essences are absorbed through skin or olfactory system and are accompanied by beneficial effects, such as anti-inflammatory effects, absence of complications, improvement of sleep, and reduction of muscle cramping, stress, and pain . Valiani et al. (2011) compared the impacts of reflexology and ibuprofen on dysmenorrhea among students. The results showed that sedative effects of reflexology continued even after the end of intervention in the third cycle . Similarly, Kim et al. (2002) assessed the effect of reflexology on reduction of premenstrual syndrome and dysmenorrhea in students and reported that foot reflexology was effective in recovery of this syndrome and dysmenorrhea . These results were consistent with those of the present work. The second goal of the current study was to compare pain duration in massage, reflexology, and control groups. The study results demonstrated that pain duration decreased more significantly in the massage and reflexology groups. Ou et al. (2012) used a combination of essential oils (lavender and combination of Salvia officinalis L. and lavender) in form of a cream in one group and a cream with synthetic fragrances in another. The results indicated a reduction in pain intensity and duration in the massage group with essential oils . Hur et al. (2011)conducted a comparative study on the effects of massage and acetaminophen on dysmenorrhea and used a compound of aromatic oils. The findings revealed that pain intensity and duration had more considerably decreased in the massage group compared to the acetaminophen group ,which was in agreement with the results of the present study. The mechanism of pain duration reduction in the massage group can be considered to be the same as the mechanism mentioned for pain intensity reduction, because when pain intensity was reduced, pain duration was affected and reduced, as well . Lee et al. (2012) also reported a reduction in premenstrual syndrome and dysmenorrhea and improvement in the temperature of lower abdomen with reflexology , which was similar to the findings of the present study in terms of reduction of dysmenorrhea. The third goal of the current study was to compare the mean anxiety level in massage, reflexology, and control groups. According to the results, changes in anxiety scores were significant only in the massage therapy group, and no significant difference was found between the reflexology and control groups. This was in line with the results of the research by Kim et al. (2011), indicating a reduction in anxiety level . Reduced anxiety by massage is probably due to regulation of emotional response by limbic structures during treatment with massage, improvement of blood and lymph flow, reduction of stress, and loosening of contracted muscles . Since stress leads to increased dysmenorrhea via increasing the stimulation of the sympatic system, reduced stress can be effective in improvement of dysmenorrhea symptoms [33-34]. On the other hand, use of aromatherapy oils reduces stress hormones and increases the secretion of beta-endorphins, resulting in reduction of anxiety level and thus pain perception . One of the limitations of this study was lack of opportunity for following up the treatment. The study results revealed no relationship between reflexology and reduced anxiety levels; therefore, further long-term investigations are required to clarify the relationship. Another study limitation was students’ lack of cooperation in correctly answering a relatively large number of Spielberger’s questionnaire items. Considering the results of this study, it seems that aromatherapy massage and reflexology reduced pain intensity and duration of primary dysmenorrhea. Since aromatherapy massage and reflexology are easy, inexpensive, and time-saving methods, they are suitable for reducing primary dysmenorrhea as non-pharmacological methods. Yet, future long-term studies with larger sample sizes are suggested to be conducted on the issue. This study was approved by Shiraz University of Medical Sciences [proposal No. 6439]. Hereby, the authors would like to thank the students who cooperated in this study. They are also grateful for Ms. A. Keivanshekouh at the Research Improvement Center of Shiraz University of Medical Sciences for improving the use of English in the manuscript. Rasoolzadeh N, Zebardast J, Zolphagari M, Mehran A.Effects of relaxation on primary dysmenorhea amongfirst year nursing and midwifery female students.Hayat. 2007, 13: 23-30. Brown J, Brown S. Exercise for dysmenorrhoea. cochrane database of systematic reviews [online]. 2010; 2: CD004142. Huether S, Mccance K. Understanding Pathophysiology. 5th ed.ElsevierMosby.st.louise,Missouri; 2013: p.799- 800. LattheP,Latthe M, Say L, Gülmezoglu M, Khan KS. Who systematic review of prevalence of chronic pelvic pain: a neglected reproductive health morbidity. BMC public health.2006; 6: 177. Chen MN, Chien LW, Liu CF. Acupuncture or Acupressure at the Sanyinjiao [SP6] Acupoint for the Treatment of Primary Dysmenorrhea: A Meta- Analysis. Evid Based Complement Alternat Med. 2013; 2013: 493038. Lockerj WM. Exercise and primary dysmenorrhoea. Br J Sports Med. 1999; 33: 227. Yaghmaei M, Mir teimoori M, Mokhtari M, Mohammadi M. The comparison of the therapeutic effect of Mefenamic acid and Mefenamic acid plus vitamin E on severity of pain in primary dysmenorrhea.Journal of reproduction and infertility.2005; 6: 187- 193. Latthe PM, Champaneria R, Khan KS. Dysmenorrhoea.ClinEvid . 2011; 2011: 0813. MarzoukTMF,El-Nemer AMR, Baraka HN. The Effect of Aromatherapy Abdominal Massage on Alleviating Menstrual Pain in Nursing Students: A Prospective Randomized Cross-Over Study.2013; 2013: 742421. Pilevarzadeh M, SalariS, Shafiei N. Effect of massage on reducing pain and anxiety during labour.Journal of reproduction and infertility. 2002; 3: 42-46. Buckle J. Clinical aromatherapy. churchilllivingstone, philadelphia, pa: lippincottwilliams&wilkins. 2003. Keville K, Green M. Aromatherapy, a complete guide to the healing art. Freedom, CA: Crossing Press. Kim, J. S., Jo, Y. J., & Hwang, S. K. 1995.
. Mcgimpsey JA, Porter MG. Lavender:a growers guide for commerical production. Crop & Food.Res., Christchurch, Newzeland. 1999. Wren KR, NorredCL. Complementary & alternative therapies: wbsaunders company [fl/mo]-elsevierscience he; 2003. White A, Williamson J, Hart A, Ernst E. A blinded investigation into the accuracy of reflexology charts. complementary therapies in medicine. 2000;8: 166- 172. Tiran D, Mack S. Complementary therapies for pregnancy and childbirth: bailliéretindall; 2000. Blakey H, Chisholm C, Dear F, Harris B, Hartwell R, Daley A, Jolly K. Is exercise associated with primary dysmenorrhoea in young women? bjog: an international journal of obstetrics &gynaecology. 2010;117: 222- 224. AghamohammadiKalkhora M, Karimollahi M: Religiousness and preoperative anxiety: a correlational study. Annual of General Psychiatry 2008; 69: 1195- 1200. El-gilany A, BadawiK, El-fedawy S. Epidemiology of dysmenorrhoea among adolescent students in mansoura, egypt. Eastern mediterranean health journal.2005; 11[1/2]: 155. Kim YJ, Lee MS, Yang YS, Hur MH.Selfaromatherapy massage of the abdomen for the reduction of menstrual pain and anxiety during menstruation in nurses: a placebo-controlled clinical trial. European journal of integrative medicine. 2011; 3: e165-e168. Field T. Pregnancy and labor massage. Expert review of Obstetrics & Gynecology. 2010; 5: 177-181. Lowdermilk DL, Perry SE, Bobak IM. Maternity &Women's health care: Mosby; 2004.
keville K, Green M. Aromatherapy: A complete guide to the healing art: crossing press; 2012. Valiani M, Babaei E, Heshmat R, Zare Z. Comparison the effect of reflexology and ibuprofen methods on dysmenorrhea in female students of Isfahan University of Medical sciences. Iran J Nurs Midwifery Res. 2010 Dec;15[Suppl 1]: 371-378. Ou MC, Hsu TF, Lai AC, Lin YT, Lin CC. Pain relief assessment by aromatic essential oil massage on outpatients with primary dysmenorrhea: a randomized, double blind clinical trial. Journal of obstetrics and gynaecologyresearch. 2012; 38: 817-822. Hur MH, Lee MS,Seong KY, Lee MK. Aromatherapy massage on the abdomen for alleviating menstrual pain in high school girls: a preliminary controlled clinical study. Evidence-based complementary and alternative medicine. 2011; 2012. Lee YM. Effects of aroma-foot-reflexology on premenstrual syndrome, dysmenorrhea and lower abdominal skin temperature of nursing students.Korean journal of adult nursing. 2011;23:472-81. Aourell M, Skoog M,Carleson J. Effects of Swedish massage on blood pressure. complementary therapies in clinical practice. 2005; 11: 242-246. Israel RG, Sutton M, O'brien KF. Effects of aerobic training on primary dysmenorrhea symptomatology in college females. Journal of american college health. 1985; 33: 241-244.
warburton DE, Nicol CW, Bredin SS. Health benefits of physical activity: the evidence. canadian medical association journal. 2006; 174: 801-809. Burns EE, Blamey C, Ersser SJ, Barnetson L, Lloyd AJ. The use of aromatherapy in intrapartum midwifery practices an observational study. Complement thernurs midwifery 2000; 6: 33-34.